If you are looking for an easy-to-use photo montage maker, then you come to the right place. WidsMob Montage Maker can help you create stunning mosaic photos with numerous tile-images. It is able to turn everything into mosaic photo or montage photos, whether you have a PNG or JPEG, you can get it into mosaic photos. What is more, you can also turn word or any image into shape montage. The whole process has been simplified with easy steps. You can also customize the mosaic photos with frame, mode, column count, size, match color and more other parameters. Thus, you can create a fantastic photomontage within several minutes. Wanna create a montage with your photo collections? Just read the following guide and have a try. When you need to make photo mosaic or photo montage, you can learn the detailed process to add photos, make montage, create montages and remove color. Please download and install WidsMob Montage first. 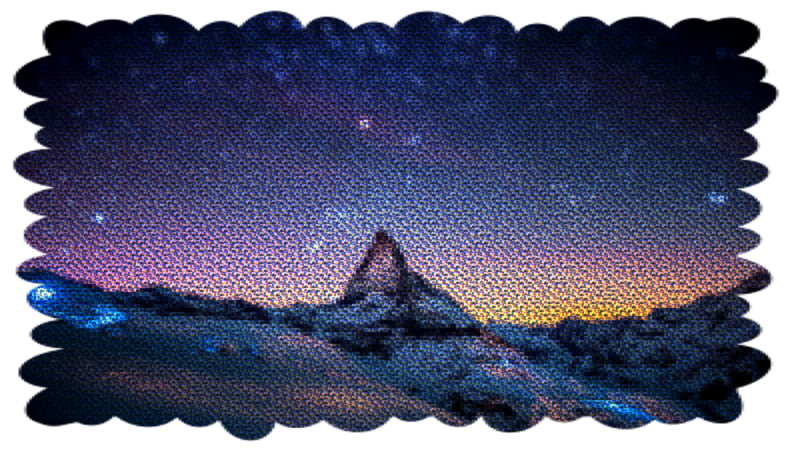 To get common photomontages, you can follow steps below to make fantastic mosaic without several hours of hard work. Actually, you can create a simple but funny photo montage as a Pro with ease. 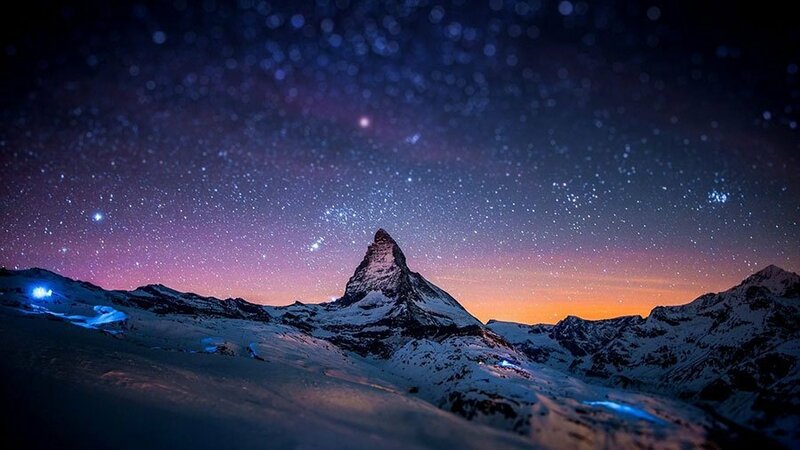 Now, let’s start the trial to customize stunning photo montages using Montage Maker here. Free download and install Montage Maker. Then double click its icon to run Montage Maker directly. Hit “Select Background” button in the lower right corner. Then you can pick out one photo from your desktop or other folders. Move the slider below to enlarge your background photo and video its detail information. In addition, you can see the width and length of your background picture in pixels. Later, press “Next” button besides to move on. Press “Select Tiles” to select more than 5 photos. Once you upload the wrong photo, you can select it and tap “Remove” button to delete. 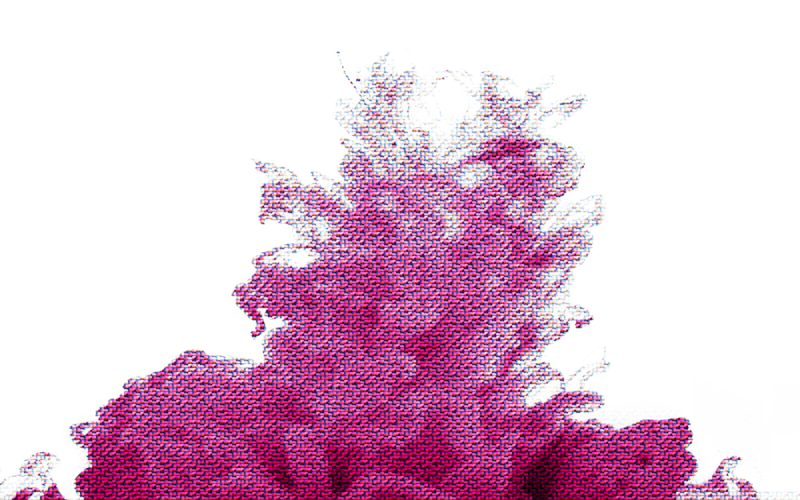 Montage Maker allows users to upload photos as much as possible to create gorgeous photomosaic. Therefore, if you have thousands of photos about family reunions and other funny activities, you can upload all of them at the same time. Then tap “Next” button to move to continue. Once you click “Next” button, Montage Marker can follow you order and start processing photomontage in seconds. 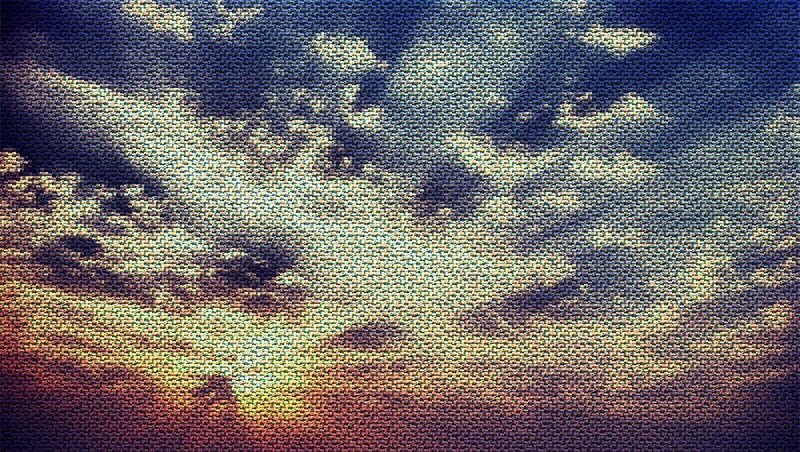 There are photo editing filters in the right panel, you can use them to modify this generated photomosaic if necessary. To be more specific, you are able to manage frames and settings to make fantastic mosaic. There are 8 different frames you can choose. And you can tick “Tile” or “Interlace” below to arrange images with different orders. Furthermore, you can move parameters of “Column Count” and “Tile Size” to adjust related Settings. Can you see the option named “Match Color” below? Well, the moment you untick “Match Color” button, the photomontage will go back to its original color. Do not forget to press “Generate Mosaic” every time you want to apply the new change you have made. Hit “Save” button to output your artwork. Then add tags if you want to distinguish this mosaic photo with others. In addition, you can also save mosaic photos to PNG, JPG and TIFF formats in high resolution. Montage Maker also support users to create photomontages with specific photo effects. For instance, you can create a photo montage of your Logo in PNG format. Be aware that you need to upload the PNG photo with mosaics contained, not the picture with PNG name extension. Launch Montage Maker on your computer. Click “Select Background” button to add a PNG image as background. As a result, you can see the object or icon you want to present only, since the background color is transparent. Choose “Next” button to move to the next step. Tap “Select Tiles” button to import photos to Montage Maker. The photo mosaic should be composed by at least 5 photos. So check if you have uploaded more than 5 pictures. In addition, you can choose the unwanted photos and then hit “Remove” button in the lower right corner to delete them. After you have selected all pictures, choose “Next” button besides. Move the slider on the bottom to view every composed picture in small icon. Montage Maker can combine all those file images without quality loss. So you can still see every small photo in detail. Then you can apply photo effects on this photomontage with filters in the right side. To start with, you need to know that only you click “Generate Mosaic” button below can you apply your newly-adjusted frame and settings. Pick out one frame you like. Later, choose whether to use “Tile” or “Interlace” mode to adjust placement of tile images. Furthermore, you can customize columns and pixels of tiles with “Column Count” and “Tile Size” sliders. If you want to match images with color of the background photo, you need to tick “Match Color” by default. Otherwise, uncheck the box before “Match Color” to see the original color of your photomosaic. Press “Generate Mosaic” every time you want to preview the photo effect. Click “Save” and set a destination folder to keep this photo montage on your desktop. In addition, you can choose the output image format as JPG, PNG and TIFF. Add tags if necessary, then press “Save” to output photo mosaic in high resolution. Here are some small tips you can follow about Montage Maker. Thus, you can save more time and get better experience during the whole photomontage-editing process. The “Back” icon locates in the lower left corner. You can tap it to go back to the former step without limitation. 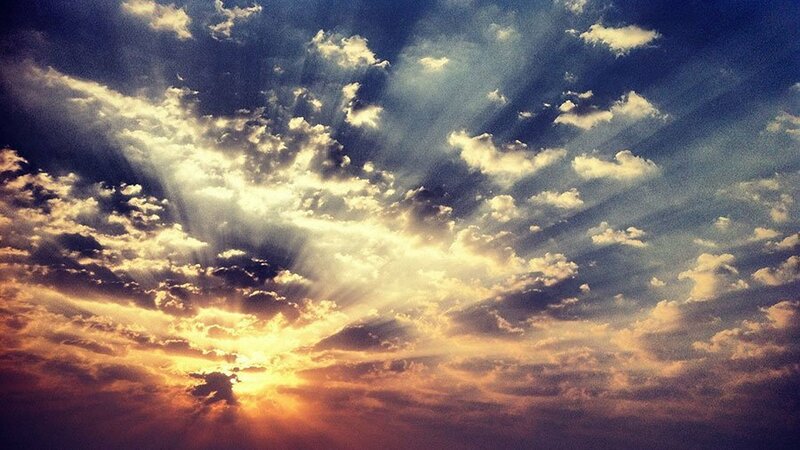 Hit “Select Background” button to upload your new background picture. You can choose “New Mosaic” in the lower right corner to create a new photomosaic. Remember to save the photomontage you are editing. Read above instructions of how to make a photo montage and do as it tells. Click “File” on the top and choose “Print” in its list. Then you can adjust the print settings. You can select a printer, set copies and choose pages in its settings menu. Finally, tap “Print” button to print photo mosaics. In order to add frames for mosaic photos, you have to create one with background photos and tiles first. Just select the frame you want to apply for the mosaic photo, it will turn the mosaic photo into a PNG file. After that click the "General Mosaic" to apply for the new frame. Make sure you save the photo as a PNG file. Just the same process to make a mosaic photo or montage photo with JPEG or PNG first. When you apply Tile mode, the mosaic is composited in tile, it should be a default mode to create mosaic photos. And you can also choose the Interlace mode, which composite the photos in a interlace way. And then click the "Generate Mosaic" button to generate a new mosaic photo in a interlace method. In order to turn some characters into Mosaic, such as the name of the company, number or other shape, you can click the "Remove Color" option for the mosaic photo to get the shape for the character of the mosaic without considering the color. If you still have anything hard to understand about Montage Maker, please don’t hesitate to contact us. We are glad to help you solve any problem whenever you need.